Home Blood sugar Flaxseed – is it a superfood? So far it’s benefits have only been scientifically proven with research on mice! But take a moment to understand how this vital nutrient has played a part in health for centuries. The flax plant (Linum usitatissimum) has been around for at least 10,000 years. It’s been found in Stone Age dwellings. The Ancient Egyptians used flax to make linen and used flax oil in the embalming process. In the 8th Century, the Emperor Charlemagne liked flaxseed so much he created laws to make sure his people consumed it! The plant travelled to North America with the early European settlers. So why has it become a rarity in our modern diet? Flax is a pretty plant, with intense blue flowers. The flowers last for only a day! Then it goes on to make new flowers in a long cycle of flowering. When the flowering is over the seed pods grow to the size of a pea, quickly becoming golden before the plant dries out and dies. Despite its short life, it has enormous health benefits. This makes it a superfood in my book! Flaxseed is one of the best sources of Alpha Linoleic acid (ALA) – vegans can get good amounts of omega 3 – the anti inflammatory omega – from eating just this. Again, only animal studies, but they show it can also help with lowering cholesterol. It also plays a big role in balancing blood sugar. This makes it a ‘must have’ for those with diabetes type 2 or borderline diabetes. Flaxseed contains lignans (not all lignans are bad Dr Gundry!) that have anti-oxidant and anti-oestrogenic effects. Think of an anti-oxidant as something that stops you rusting on the inside! Think of anti-oestrogenic effects as a help towards reducing the likelihood of breast cancer for women and prostate cancer for men. At present no one is totally coming out about the effects of a sea of plastic in the oceans, rivers and our water supply. My advice is to stay ahead and eat more flaxseed. For me – this is the big plus for flaxseed. Just one tablespoon gives a huge amount of fibre in your diet. This fibre can grow healthy bacteria in your large intestine (not the small intestine which should be relatively free from bacterial growth). This binds water to your stools aiding transit time through the intestines. It reduces constipation. No need to invest in expensive Lactobacillus and Bifidobacterium, just eat flaxseed. GREAT! It optimizes overall health – just makes you feel good! 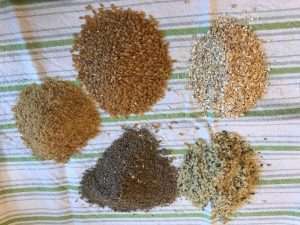 Flaxseed is a diverse food substance with vitamins like E, K, C, B1, B2, B3, B5 & B6. Minerals status shows it has calcium, iron, magnesium & phosphorus. Just from tiny seeds; this is awesome! For me the seed has to be ground up to be digestible. This means buying the whole seed, preferably golden flaxseed, putting it through a Nutri Bullet, then using it. Flaxseed can oxidise (rusting!) quickly when ground up. Best of all, try my Eat-anytime- muesli for a big health helping. One warning flaxseed oil does NOT equal superfood! Flaxseed oil has a delicate and easily oxidised (think rusting) nature. Cooking with it can also damage the omega 3 fats, so don’t heat it in a frying pan. The oil in a bottle should be clear, golden yellow. No cloudiness. no sunlight or any light exposure at all until use. Be really careful if you have allergies – watch out for hives, itchy palms, eyes, possible nausea, possible vomiting. If you eat too much then your blood sugar can drop too much. Everything in moderation. If you eat too much it can increase the frequency of bowel movements.